(Review) Big City, Dirty Nights by Alec Cunningham - Mama's Dirty Li'l Secret® - "If Prince were punk" : Mama's Dirty Li'l Secret® – "If Prince were punk"
With a band name like Mama’s Dirty Lil’ Secret and an album name such as Big City, Dirty Nights, you cannot help but to think that this band and their album are slightly out of the ordinary and perhaps a bit foul in one way or another. As the band’s second EP, Big City, Dirty Nights covers shameless partying and self-indulgence in a fun, fast-paced punk rock style. 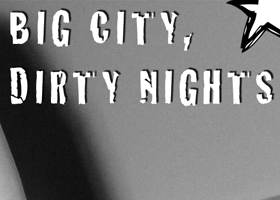 The album title is compiled from two songs, “Dirty Nights,” and “Big City Underground,” which convey an interesting view of night life in the big city. The EP sticks with a simplistic punk song structure, often repeating single lines of each song multiple times. They kick things off with a raunchy tune about a slutty girl who the narrator claims wants to be his lover. The song title, “Dirty Nights,” tells it all. Though the song does not specifically say it outright, it does not take much to figure out that the girl has invited him back to her room in order to become sexually involved. The beat picks up again with “Big City Underground.” This is not your usual party song, but it is still a song that can be enjoyed by any college student or alcoholic. He sings, “We won’t see the sun come up until your freak is funky. Then we stop, and do it all over again.” The band wraps the EP up with an interesting cover of the well-known “My Favorite Things.” Though it is a short song that barely reaches over one minute, they do well to grab your attention and make your listen worthwhile. Since this is originally a song with happy pop attributes, it is odd to hear a punk remake of it, especially when they are singing about such cute, delicate things as “raindrops on roses and whiskers on kittens.” Though this may initially throw you off, the band does a good job of transforming the song into something of their own. The EP is covered in rough, heavy guitar riffs in the overall style of Bad Religion or of Green Day in the late 1990s with their albums Nimrod and International Superhits! They portray an underlying sense of darker cynicism within Big City, Dirty Nights, though the exact ways of depiction vary from song to song.